As part of the Jay Street-Metro Tech Station (Brooklyn) rehab, the MTA’s Arts for Transit division has installed a 103-foot-long mural along the newly renovated mezzanine. Designed by Ben Snead, the piece is called "Departures and Arrivals", and it is a metaphor for the melting pot of the Borough of Kings. 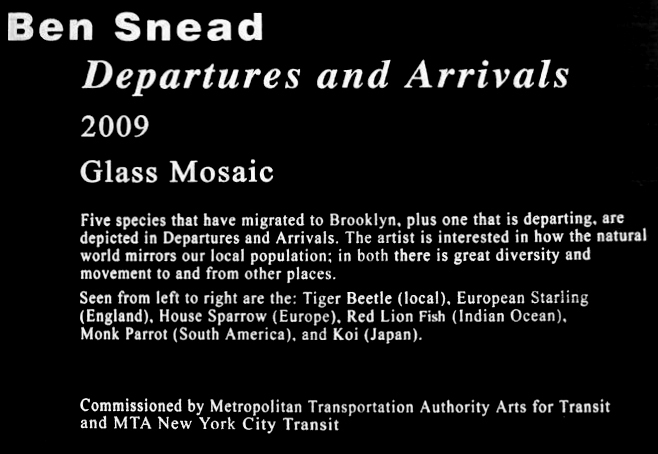 It features species of animals that have migrated to Brooklyn and one that is departing. 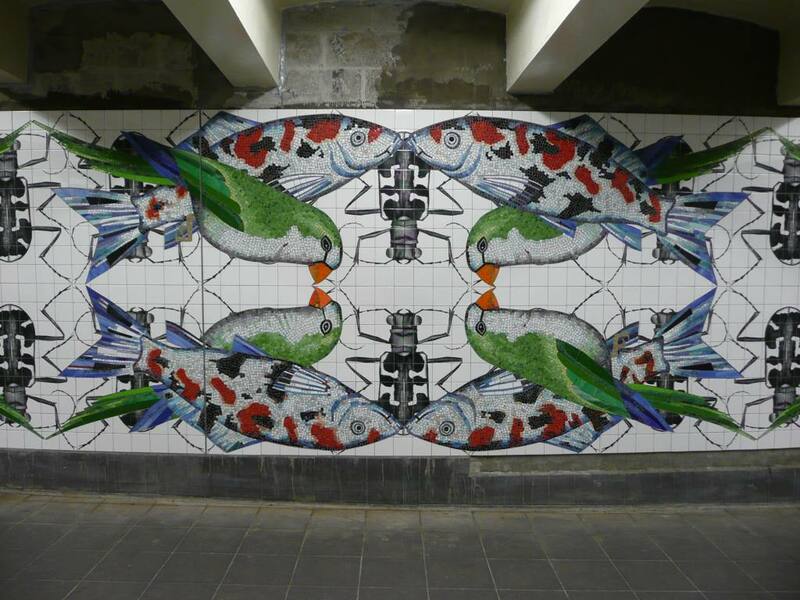 The ceramic tile mosaic depicts several species of animals that have migrated to Brooklyn over time, such as the European starling, Monk parrot and Red Lion fish. (The Tiger Beetle, a local species in decline, is also represented). 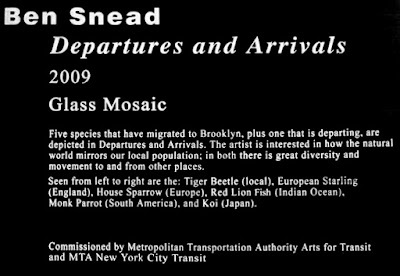 “It sort of mirrors immigration and how Brooklyn is made up of a diverse group of people,” said Snead, himself a transplant from Boulder, Colorado, who was commissioned by the Metropolitan Transportation Authority to create the mosaic. Snead designed a miniature model of the mosaic in 2006, and sent the maquette to Franz Mayer of Munich, a German-based architectural glass and mosaic manufacturer. The firm replicated the mosaic in life-size using Italian and Mexican tiles, then shipped the finished product back to Brooklyn, where it was installed in sections at the subway station in October of 2009.